A friend of mine recently hosted a Busy Bag Swap! We had about 15 people take part, and it wasn’t too challenging to set up. The main thing you need is a place to have the swap, people to participate, and ideas for activities to swap. 1) First, we set up a date and time and made a Facebook event page. We invited friends with little ones. 2) Each person who decided to participate picked a busy bag they wanted to make and let everyone else know what they had picked — we didn’t want anyone to do the exact same activity! 3) Once we found out for sure how many were participating, everyone went to work to make that many bags of the activity they had picked. 4) We met one day at a local church for about an hour to exchange the bags we made. 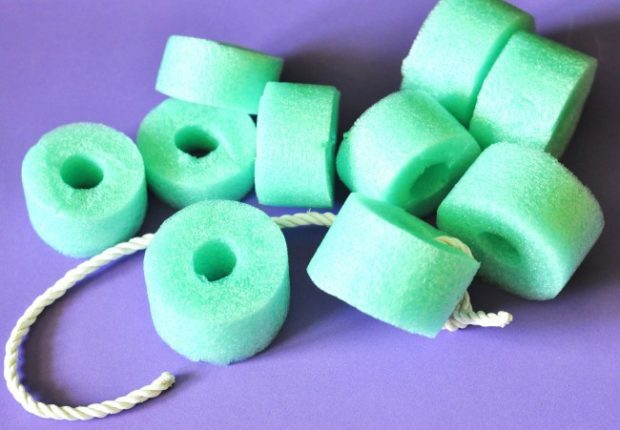 Cut up some pool noodles, give your child a length of rope (tie one of the noodles on the end of the rope, so they don’t get frustrated by the pieces falling off), and let them string it. If you have different kinds and colors of pool noodles, they could also do some patterning. This busy bag uses items you have around the house. 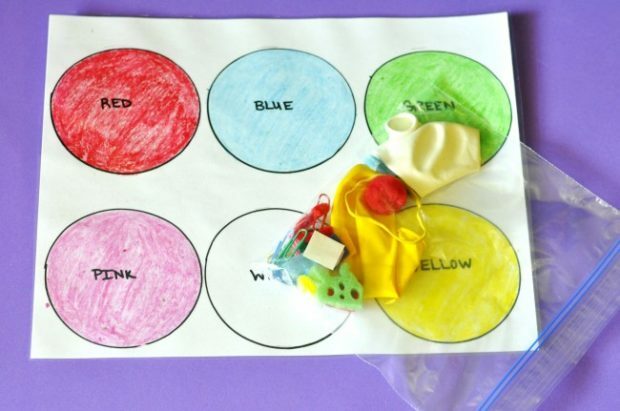 Find items of various colors, make a color mat, and have your child sort the items by color. 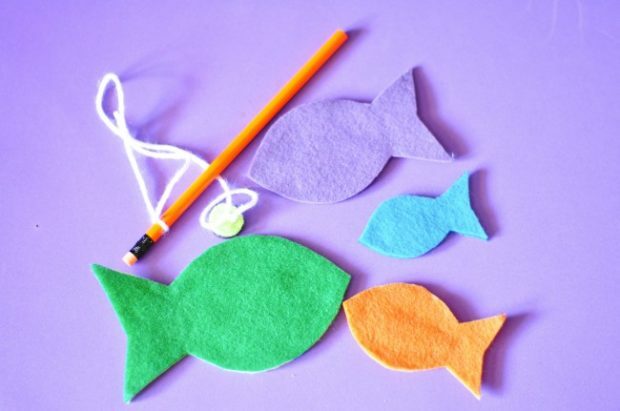 These shape sticks were made with jumbo craft sticks and velcro dots. Also, the colored dots give a visual clue for preschoolers and help keep the correct sticks together to form the shapes. The lady who made these also included extra sticks with velcro for exploratory play. 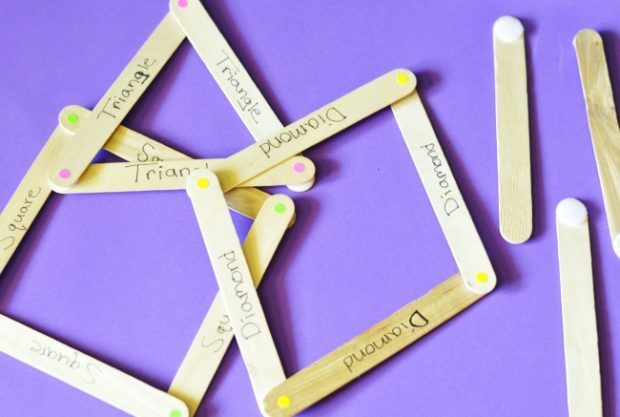 You can also make magnetic craft sticks for shape play. 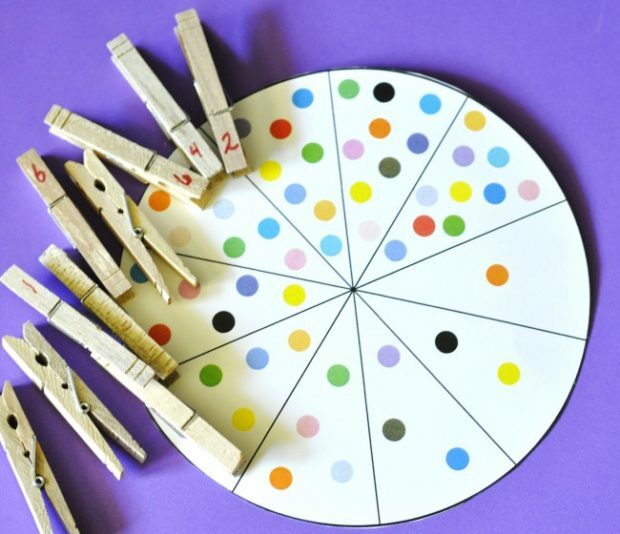 This busy bag involves labeling some clothespins with numbers and having your child match them to the corresponding number of dots on this printable number wheel pattern. 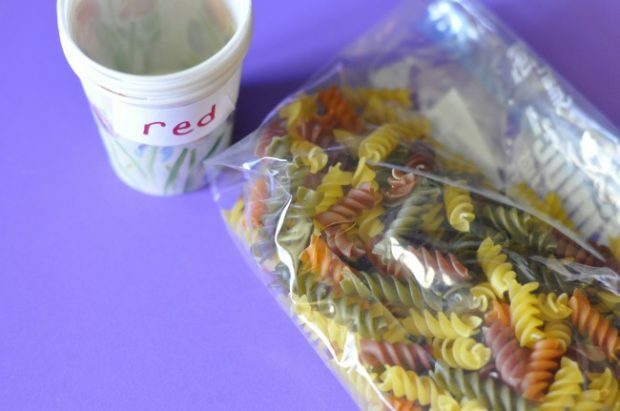 You could dye the pasta noodles, but this is a much easier (and less messy) way to do it. Purchase tri-color noodles and regular noodles. Label some cups and have your child sort them. 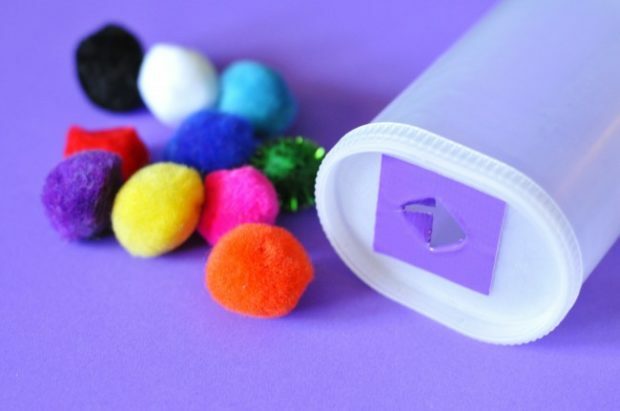 Use a container with a lid and either cut a hole in it (and put tape around any sharp edges) or use a wipes container and fill it with pom poms. Have your child dump them out and stuff them back in. My friend Crystal, over at Money Saving Mom, has quite a few busy bag ideas. One of them is this clothesline busy bag and it includes printable patterns! You can also download Money Saving Mom’s pattern for this cupcake busy bag. 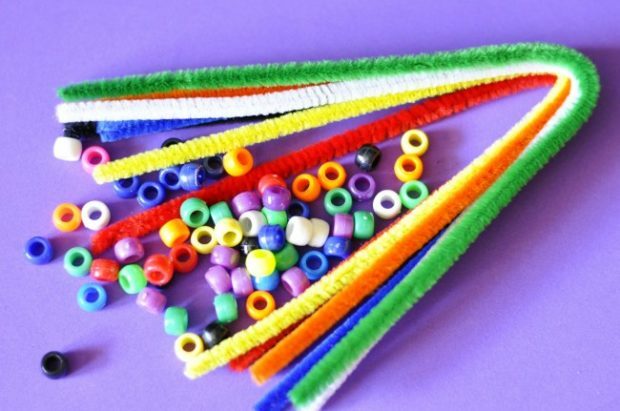 You can use a variety of materials for bead stringing. This particular bag includes pony beads and pipe cleaners for stringing. This is an excellent fine-motor bag. You could also make patterns or sort by color. This busy bag is a variation of this button snake. I love what my friend did for this though! 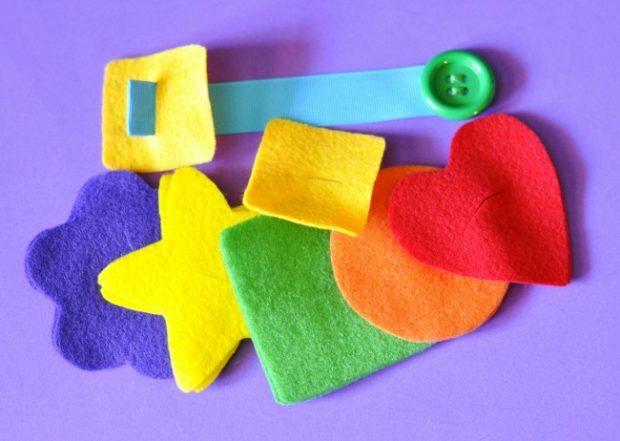 She cut out felt shapes in rainbow colors to string onto the ribbon. 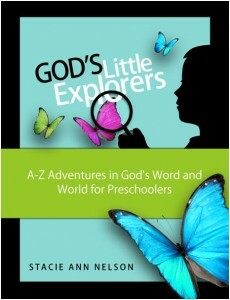 Once again, you could have your child sort by color, identify shapes, or make a pattern. 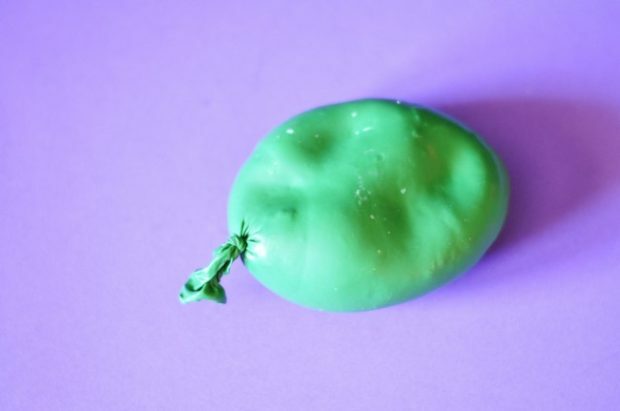 Using playdough and a balloon, this is a unique toy. Find directions to make the wacky sack here. This bag has several strips of paper with slight tears in them. 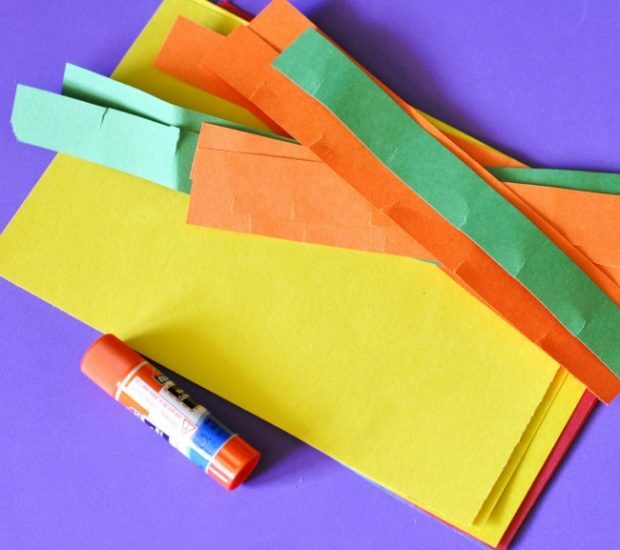 Have your child tear the paper and glue it onto the plain sheets of construction paper. 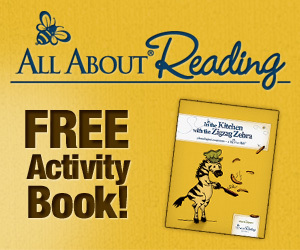 Find scissor skills busy bags here AND more in my free eBook: Learning Bags, Baskets, and Boxes. 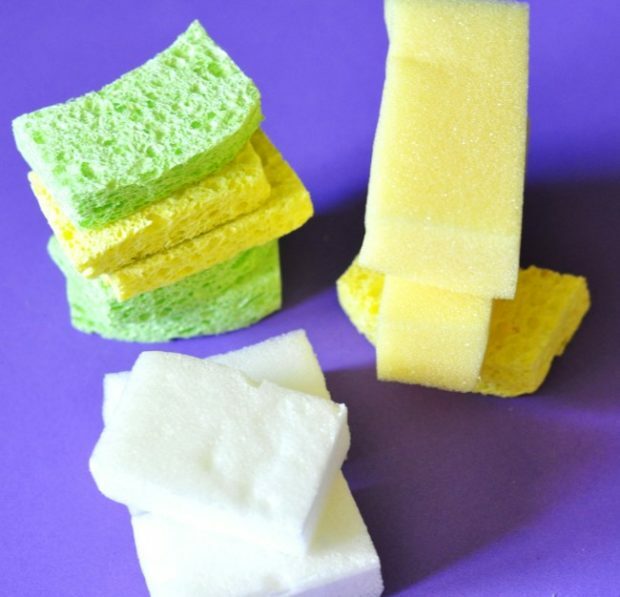 Cut several kinds of sponges and place in a bag. Your child can stack these up to make towers or make patterns. These are pretty easy to make (especially since there is no sewing involved), but I always recommend keeping an eye on your child when you have small magnetic pieces around! 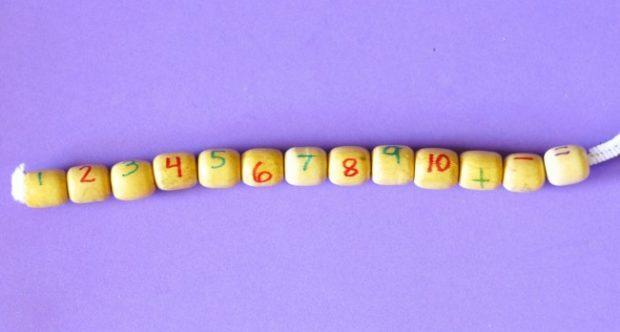 I was given a huge jar of wooden beads, so I decided to write the numbers from 1-10 with a permanent marker. I used different colors for even and odd. I also added +, -, and = signs so you could do some math fact practice in addition to stringing the beads by number onto the pipe cleaner. This can be easily adapted to whatever you have on hand. 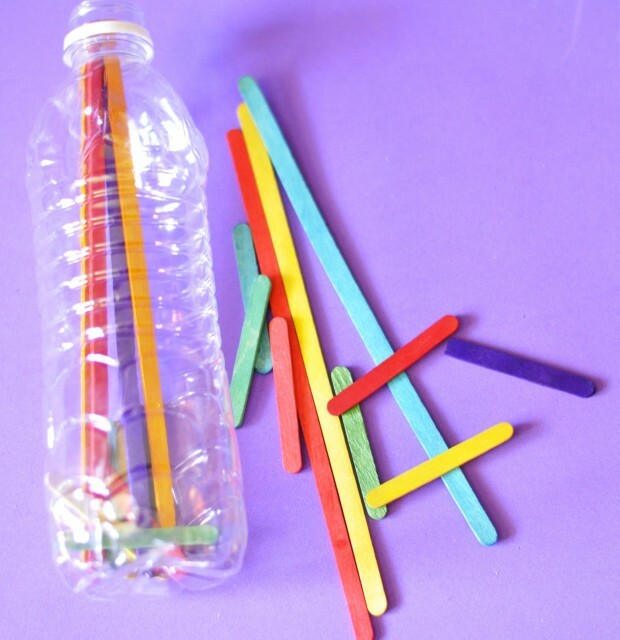 I was given some mini colored craft sticks, so I just stuck a few of them into a water bottle. My almost two-year-old niece was entertained for quite some time by just sticking the sticks in the bottle and dumping them out. You could also use beads, rocks, regular-size craft sticks, pipe cleaners, etc. 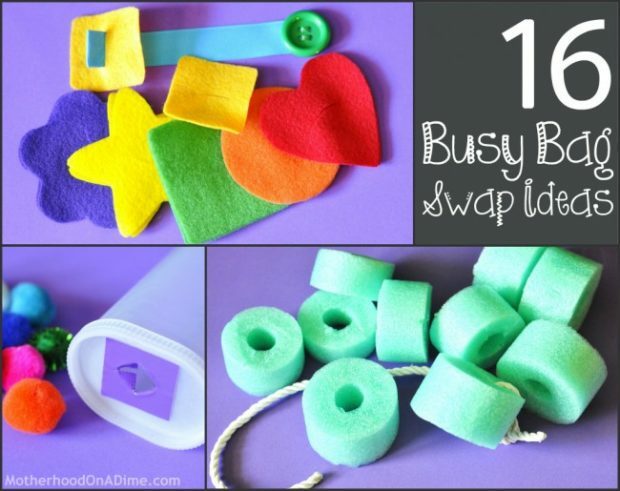 If you’d like more ideas, you can check out my Pinterest board with various busy bags and this page on my blog with busy bag activities (“learning bags” is my name for them). 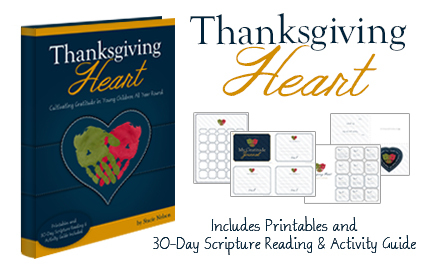 Through November 21, 2012, get my NEW eBook, Thanksgiving Heart: Cultivating Gratitude in Young Children, for just $1.99. What a fun idea, Stacie! Love it!! Thanks, Kristen! We did have a great time. It really wasn’t too challenging to set up and the fellowship (and bags I didn’t have to make myself) were awesome! Totally wish we had an opportunity for a local swap in my area but we don’t and there is no such thing around here. Since no one locally will host a swap, I’m going to do a Teaching Class for my moms group from church later this month…in which I’ll teach them the basics of how to build these bags, best ways to save $ when making them, an option to buy some of my bags in-stock, and so forth. Loving your collection of ideas in this post. There are similar versions on Pinterest and other blogs but it’s nice to see a list in one spot like this. (Are you on Pinterest? I’d love to follow you!) We also have some on Pinterest and post the results of our “Preschooler Tested Results” & made adjustments to make it easier for their little fingers….such as our favorite “Mr. Push It”; like yours but we used a hole punch in the lid of a container instead of cutting a slit (like you said, that can be sharp). Hi, Rachel! We just kind of pulled one together — asking ladies we knew with toddlers and preschoolers. I bet you could find enough people interested! Everyone had a great time with it! 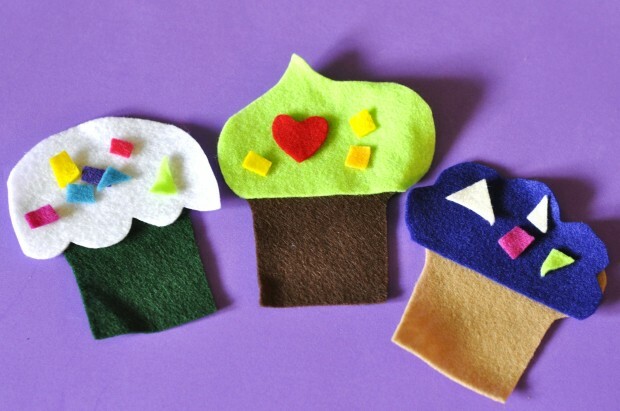 Maybe after our class, I’ll try to see if they want to host a swap next month…these are great gifts and it’s a great time of year to make them for the upcoming holidays!! Thanks for the note, Stacie! I was bummed I couldn’t make it. I hope there’s another soon! Will there be another swap? I would love to participate, if there is? I’m not sure, but you can easily set up your own if you’d like!! It takes a little bit of prep, but it’s not too bad! I’ve linked back to this post on our blog! Thanks for some wonderful ideas! Just wondering the set up of one of these busy bag swaps…does everyone bring one bag of items to be swapped? How does the swap go down? Everyone tries your bag and whosever baby likes it best should swap that one out??? I’ve never done or been a part of one but I would love to organize one. Just want to be sure of how to run it. Thank you. Love your blog!!! When we did it, each person made 1 kind of bag and made enough for everyone in the group. Then, everyone got one of each kind of bag that was made! I’m thinking about setting up a Busy Bag swap, I love your ideas! Did you invite moms only to the swap or did they bring their children with them? And if kids were invited to you set a specific age range? Thanks for the ideas! We had a few friends with older kids volunteer to watch the younger kids while we were doing the actual swapping part, and we were able to do it at our church, so there was a nursery room available. It worked out well that way! After we did it, we talked a little bit about doing two separate swaps–one for toddlers and one for preschoolers, so that is an option, too. I find most kids will adapt the activity to whatever they are developmentally ready for anyway (i.e. 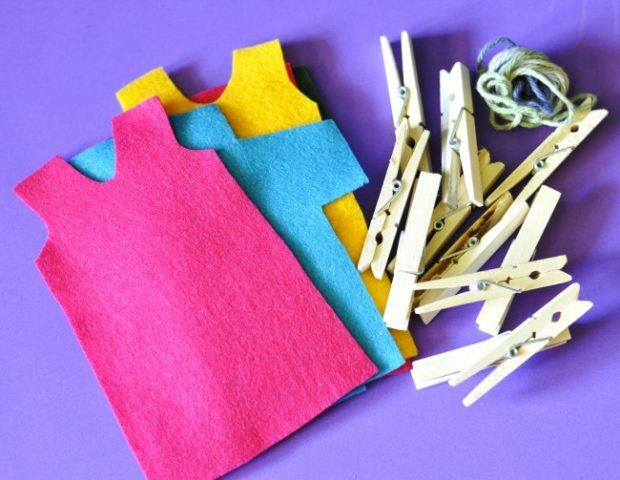 a toddler may not be ready to do the clothespin number match correctly, but they may still enjoy trying to clip the clothespins onto the wheel). If you had a lot of moms with just toddlers or just preschoolers, it might be something to consider though. OH!!!! This Post its The solution to my problemsss!!!!!!!!!!!!!!!!!! thank you so much!!!!!!!!!!!!!!!!!!!!!!!!!!! !